Tableau is the tool of choice for analytics at UCOP and at multiple UC campuses. UCOP IRAP has found it to be a great data exploration tool and created the UC Information Center using Tableau. 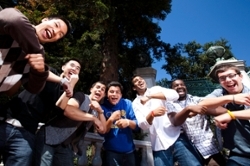 UC TUG (UC Tableau Users Group) is a group of Tableau users stretching across the University of California system. We meet monthly to discuss product updates, share best practices, present how-tos, and provide critique for reports-in-development and much more. If you're a current user or are just interested in what the product can do, drop in! For more information or an Outlook invitation, contact Ola.Popoola@ucop.edu or Poorani.Rajamanickam@ucop.edu. It helps everyone gets smarter with the tool as we share tips and best practices. It encourages networking and collaboration between Tableau users who can bring fresh perspectives to projects and initiatives across the UC system. If you would like to get started with Tableau, download a free copy from the Tableau download Site. On this site, you will find several resources that will guide you through the installation process. Once you are ready to purchase a full Tableau Desktop license, please contact the Thomas Trappler at UCLA by sending an email to: Thomas.Trappler@ucop.edu. For more information about using Tableau and other products available, visit https://www.tableau.com/support.